The northwestern part of Sichuan is located in eastern side of Tibetan Plateau, next to the Gansu-Qinghai area. Painted potteries were being found in that area as early as previous century and drew great attention. More sites with painted potteries were identified after a number of investigations and excavations in this area. 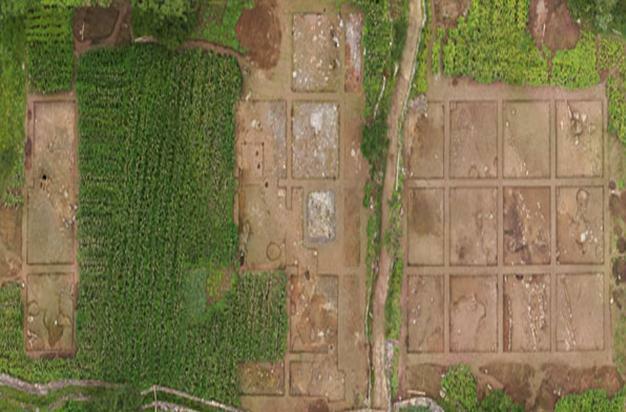 Liujiazhai site was a recent discovery during the infrastructural development in Sichuan. It is a Late Neolithic Site situated at Liujiazhai, a second terrace of Ergali town, Jinchuan county in Aba Tibetan and Qiang Autonomous Prefecture. The height was around 2,650 meters. 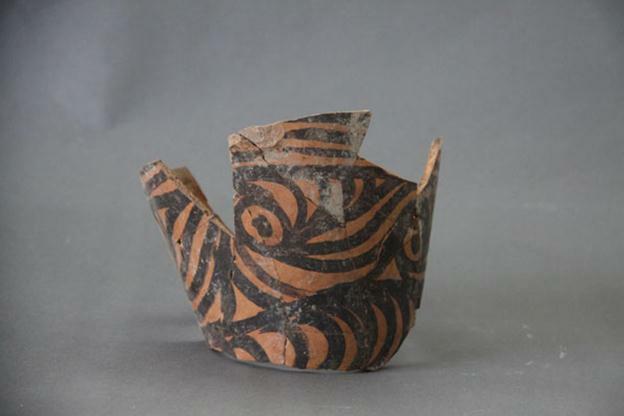 An archaeological excavation was jointly conducted by the Sichuan Cultural Relics and Archaeology Research Institute, and the Administration of Cultural Relics in Aba Prefectures and Jinchaun county in two different phases from September to November 2011 and May to September 2012. The total excavation area was around 3,500 square meters with splendid results. More than 350 features were identified during two excavations including 298 ash pits, 1 ash trench, 16 house foundations, 26 pottery kilns, 7 stoves and 2 burials. More than 6000 artefacts were discovered such as pottery, stone tools, bone and horn fragments. There were a large number of pottery sherds being reconstructed. 1. The ash pits discovered in Liujiazhai were mainly in circle or near circle and a number of them were in irregular shape in plan. While various shapes such as pot bottom, straight tube or even bag shape were identified from profile sections. In the wall and bottom of some ash pits, traces of using tools were identified. A number of pottery fragments and animal bones were found within the pit deposit. In addition, large amount of microliths and charred floral seeds were identified after sieving and flotation. The form of the deposits identified in some ash pit was unique as only big pottery fragments or large quantity of huge animal skeletons were concentrated in the deposit. 2. House foundations were identified in different cultural stratums. Rectangular wooden framed mud-wall and circular postholes house foundation were identified in the low stratum. Width of the foundation groove was around 15-20cm and the diameter of the posthole was small. The house area was only a few square meters. For the upper stratum, square stonewalling structure was identified with deeper foundation groove. The thickness of the wall was around 50cm with several compartments. The construction area was around dozens square meters. Three stone dikes were found in the southern section and divided the house foundation of upper stratum into three rows with 2 to 3 house in each row. There were only 4 remaining living surfaces, which can sketch the interior structural formation of a house in Liujiazhai Site. * Type 1 was an digged hole as an operational room and fire box. Only the operational room, fire door, fire box and flue remained and no chamber can be identified. * Type 2, no operational room can be found. The fire box was located in the slender slope with chamber on top. * Type 3 was a pottery kiln with rectangular small pit as ash box covered by stone slab. A circular chamber was constructed on the ground. This type of kiln probably was the early form of the dome kiln, such as kiln 2012Y11 and Y15. It is noted that a certain amount of reddish clay heap have been identified in the excavation area and the largest one was around few square meters and the remaining height was 10 – 30cm. Further examination is required to ascertain whether the clay heap is associated with the pottery produce. 4. Two burials were identified near the house foundation and the remains should belong to a child around ten years old after preliminary assessment. No burial item was found. Burial M1 was an earth shaft tomb with the extended supine position. Burial M2 was buried at the bottom of an oval shape ash pit in flexed supine position. Other than abundant archaeological features, copious amount of artefacts and animal skeletons such as pottery, stone tools, bone tools were also identified within the site. For the pottery, it can be divided into coarse sandy pottery and clay pottery. Most of the coarse sandy pottery was flat base and the majority was brown and grayish brown pottery. The pottery was with square rim with incised corded pattern and some of the rims even with pressed decoration. The body was decorated in corded pattern, cross cord marked pattern, attached clay pattern, etc. For the clay pottery, it can be divided into painted and plain pottery. Most of the painted pottery was reddish brown clay and a few grayish clay. Black paint could be seen in basin, bowl, bottle with curved line pattern, curved triangle pattern, net pattern, dotted pattern, swirl pattern, ripple pattern, grass pattern and etc. Besides, trowelled grey pottery and black pottery were found in clay pottery. Some of these potteries have sophisticated handle such as chicken comb, pan and twisted handle. Typology of these pottery including jar with flared mouth and deep belly, long neck pot with rounded belly, vase with double lips and pointed base, flat base vase, swirled edge basin, basin with folded rim, spouted pot, bowl, cup, lid cover, pottery ball, pottery ring, pottery beater and etc. For the unearthed stone tools, the majority was polished while chipped stone tools were also found. Polished stone tools include axe, adze, knife, sickle, chisel, arrowhead, hammer, grinder, stick, pestle, hairpin, ring, disk, spinning wheel and etc. For the chipped stone tools, scraper, microlith, small stone core, small stone blade were identified. In addition, small amount of huge stone tool manipulated by its natural shape were found. These stone tools including axe with handle and pick mattock, which were first identified in Sichuan province. Most of the bone tools are made of animal limb bone and typology including awl, needle, chisel, scrapper, knife, dagger, dart, hairpin, ring, stone blade with bone handle and other bone decoration. Small amount of decent decoration items made of clam, horn and tooth were identified. The quantity of bone awl was huge, which was the main feature of the site, and some of them were not being processed, only light traces of usage could be identified. Based upon the preliminary classification of the animal skeletons, boar, sheep, deer, muntjac, water deer, monkey, hystricidae, turtle, fish and other poultries were identified. The majority of these animals were sheep, deer and water deer. The Liujiazhai Culture was similar to those in Yingpanshan and Jianweicheng site. The features were also similar to those in the phase IV of Daidiwan site in Ganshu-Qinghai region, phase IV of the Shizhaocun site, Linjia site of the Dongxiang and the Majiayao Culture located at the upper stream of the Bailong river. The dating was around the Late Yangshao Culture in general. Nevertheless, the findings of the Liujiazhai Site were much more than those in the Northwestern Sichuan of the same period. The site is regarded as a prominent Neolithic site, which provides valuable data for understanding the Late Neolithic archaeological culture in that particular area.